The kitchen is the heart of the home. We take pride in creating lasting quality, timeless in appearance, appealing and complimenting designs with both today and tomorrow in mind. The design of a kitchen is important in achieving a functional working area and plenty of storage. With individuals we listen to your ideas and expectations, offer advice to ensure the end results are perfect for your needs. Our services include organising other trades persons (electricians, carpenters, plumbers etc) for the renovation of the kitchen. We also manufacture kitchens for builders, interior designers and architects to their plans and specifications. We offer all our customers quality workmanship and a high standard of service. Click here for some pictures of our quality Kitchens. For some more Kitchen thoughts click here for the Design Thoughts Page. The bathroom is used everyday and the design of the vanity need to not only look pleasing but designed to utilise the available space most efficiently. 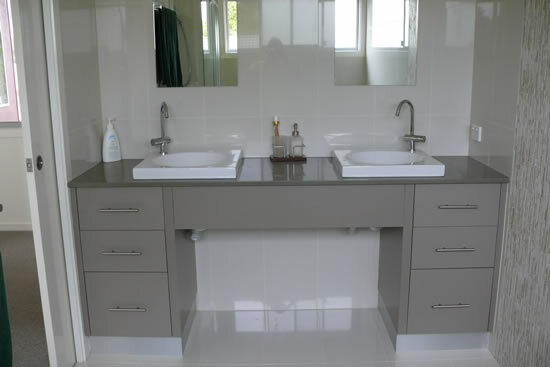 We offer a variety of basins and bench tops to create a traditional or contemporary feel to your bathroom. We pride ourselves on quality workmanship and a high standard of service. Click here for pictures of our quality Bathrooms. For some more Bathroom thoughts click here for the Design Thoughts Page. The hardest working room in the house needs to be functional, have good use of space and plenty of cupboards and bench space. With our expert advice and the latest hardware available a well designed functional laundry can be possible even in the smallest of rooms. For some more Laundry thoughts click here for the Design Thoughts Page. A well organised wardrobe is easily achieved with a custom design wardrobe to suit your needs. With hanging rails, shelving, drawers and the latest accessories a functional layout for a wardrobe is accomplished. Click here for some pictures of our quality Wardrobe and storage solutions. We manufacture custom designed entertainment units that suit individual cabinetry needs and are both appealing and complimenting in design. We offer quality workmanship and advice on achieving plenty of storage space for all your equipment, DVDS etc. 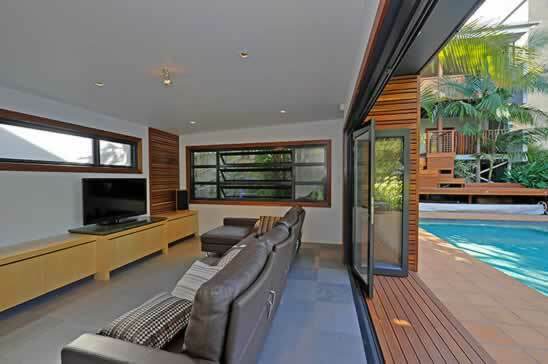 Click here for some pictures of our quality Entertainment Units. We offer complete fit outs for the individual office or the larger business office or for shop interiors. We advise on small fit outs and will custom manufacture to plans and specifications from builders, interior designers and architects. We offer quality workmanship and a high standard of service. Albany Cabinet Makers offer customers the time to listen to your needs, a budget that suits your pocket and a quality custom design cabinetry that suits your life style and desires.